I have to admit that I wasn’t too keen on making these cookies when I first saw the recipe on this website . 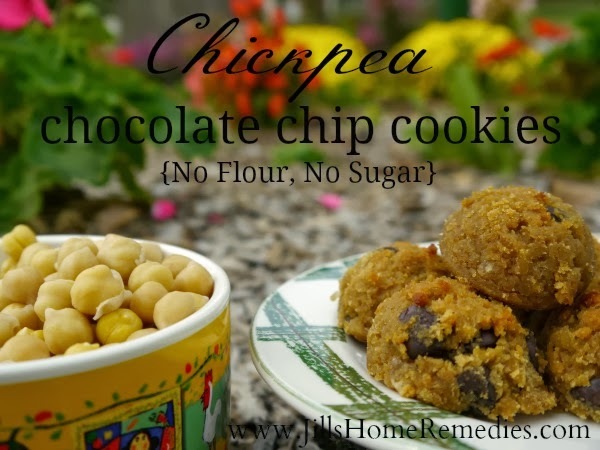 How is it at all possible for chickpeas to be appetizing in a cookie? I then began loving the possibility of finding a tasty, healthy cookie that contained no flour or sugar. And after reading so many positive comments about how good the cookies are, I decided to give them a try. I have to say that I was surprised when I tasted the cookie! I could not taste the chickpeas at all. I found them delightfully good. There’s no guilt when eating these! Blend all but the chocolate chips in a food processor or blender until smooth. If you use a blender, you will have to add 1/4-1/2 cup of water. This makes the dough more runny, but the cookies still turn out really good! To make them more chocolatey, add 2 tbsp. of cocoa powder! Have you ever made cookies with an ingredient replacing the flour?